Kuhnhenn | Beer Apprentice - Craft Beer News, Reviews, Interviews and Info. Hi guys. How’s everyone doing? Good I hope. Well, for today’s craft beer review I’m going to be trying the Kuhnhenn Bourbon Barrel 4D (Fourth Dementia) Olde Ale produced by the Kuhnhenn Brewing Company located in Warren, Michigan. I don’t know a thing about this beer or this brewery, and I couldn’t find anything specific on the website, kbrewery.com, about the brew, so I guess we are just going to have to try it and see how it tastes. Again, a big thanks to Mr. Liquid Bread (Chris Phillips) for the beer. The 4D comes in a 12 oz. bottle and it has a hefty ABV of 13.5%. It poured a very dark brown to dark mahogany color. A very slight and small light tan head. What was there was smooth, but very thin. It left a ring around the top, however no lacing was found. Only heavy alcohol legs, which really hung onto the sides of the snifter. The nose brought forth a heavy waft of Bourbon Whiskey along with a significant earthy/woody characteristic. Deep, dark fruits of plum and black cherries. Very mild tones of vanilla along with a sugary, syrupy smell. The aroma was good, but it was very robust with the alcohol tones to say the least. The flavor presented a lot of booze. Very strong and sturdy with savors of wood and molasses. The dark fruits were noticed, but they seemed to be pushed to the side while the Bourbon dictated the overall taste. Not as balanced as I thought it might or could be. Maybe just my preference. The mouthfeel was full bodied and thick. Very sticky, dry and chewy. Very low carbonation with a ton of alcohol warmth and burn. As to be expected, a lot of flavor was left covering the palate after each sip. Well, I thought this beer was pretty good, although it may still be a bit too young for my liking at this point. It had a very aggressive amount of Bourbon. That, in turn, made the drinkability factor was a touch low I thought. I had to take small sips for the entire experience. It could definitely be a “go-to” beer during the cooler weather of Fall and Winter, however during the warmer days of Spring and Summer it proved a tad difficult for me to handle. I’d say that if you could hang onto a bottle for a year or two it may mellow, become way more bearable, and more balanced. That’s not saying that the beer was bad by any means. 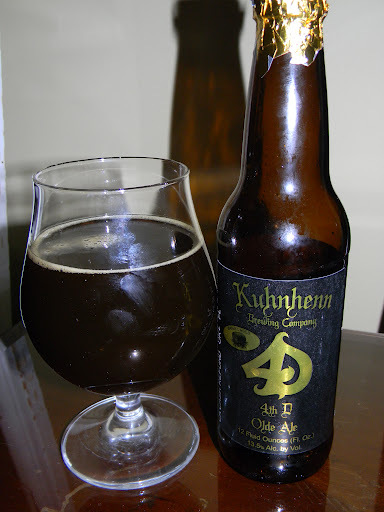 If you like brews that are heavy on the Bourbon and woody flavors, the Kuhnhenn Bourbon Barrel 4D Olde Ale would be an ideal beverage for you to try. If you are able to find a bottle and sample it let me know what you thought.